Asphalt shingles piled on a lot in southern Dallas has been dubbed 'Shingle Mountain' by local environmentalists. Photo courtesy of Downwinders at Risk. A group of environmental activists aim to move a mountain in south Dallas. That is, Shingle Mountain - the five-story pile of discarded shingles looming over a residential neighborhood in Southern Dallas. The recycling operation turned toxic waste site was put on hold temporarily last Thursday. Civil court district Judge Gena Slaughter signed a restraining order that stops owner Blue Star Recycling from adding shingles to its site on South Central Expressway for two weeks. The court will reconvene to review the order April 3. Problem is, that’s not the only site where Blue Star is stashing the asphalt-laden shingles. Also, the crowd of activists who called for the recycling company’s shutdown see such operations as an area-wide problem that one closure won’t solve. Watch a video about the five-story shingle pile in South Dallas by local filmmaker Rick Baraff. 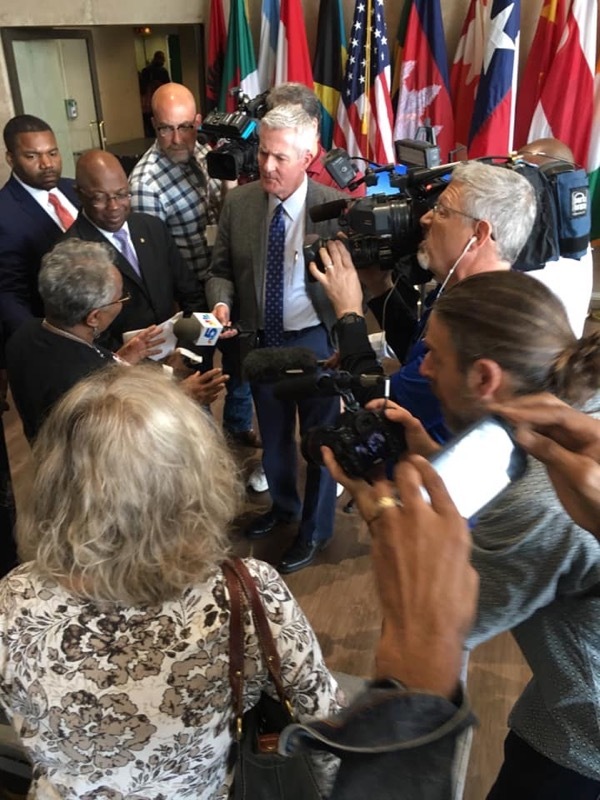 The court order came one day after local activists allied as Southern Sector Rising filled the Flag Room adjoining Dallas City Hall with a near-capacity crowd, to expose Blue Star’s effects on residents. Residents spoke, along with veterans of the Dallas civil rights struggle and campaigns against West Dallas lead smelters and other polluting industry: Peter Johnson, Luis Sepulveda and John Fullinwider. The press conference also brought out state Sen. Royce West and two present and former District 8 City Council members, respectively Tennell Atkins and Erik Johnson, competing now for re-election. DFW media talk to Dallas resident Marsha Jackson, who lives next to Shingle Mountain, at a press conference held at Dallas City Hall March 20. Photo by Yolonda Blue Horse. Marsha Jackson, who can touch the shingle heap through her back fence, told the crowd what it’s like to live where the black dust in the air makes you cough and asthma attacks rob her granddaughter’s energy to play. This began soon after Blue Star started operation in January 2018. “My wife and three kids are sick all the time, two or three days a week,” said neighbor Resendo Garcia, in a short video, posted above. The permitted purpose of Blue Star was to grind up old shingles and sell the material for reuse. This reduces them to black asphalt dust that blows through the air on windy days. The crowd of activists who called for the recycling company’s shutdown see such operations as an area-wide problem that one closure won’t solve. Through 2018, Jackson’s calls to 311 and Dallas city code enforcement had brought out a code inspector and a waste department employee, but Blue Star made no lasting changes. The City only required reinforcement of the banks of a nearby tributary of Five Mile Creek, to keep storm water runoff from carrying shingle trash into the water. Blue Star is in violation of its permit to operate, the Texas Commission on Environmental Quality found in November. Recent air monitoring by Downwinders at Risk and Dr. Tate Barrett of the University of North Texas shows its emissions of hazardous particles exceed World Health Organization standards. The TCEQ investigation found two violations. Blue Star didn’t have a fire prevention and suppression plan for storing combustible materials outdoors, which also violates City of Dallas fire ordinances. It still lacks a fire plan, according to recent follow-up by environmental activist Jim Schermbeck. Neither has it provided adequate financial assurance for closure of the site. In December, the company was holding more than 200 times the 605 tons of whole and ground-up shingles that it estimated to TCEQ in its initial Notice of Intent to Operate. It had only $8,000 in assurance funds. Blue Star Recycling is looking less like a recycling facility and more like a dump. And those nearby say the piles have only grown since December. What’s next? Environmental activist Schermbeck attended the restraining order hearing. 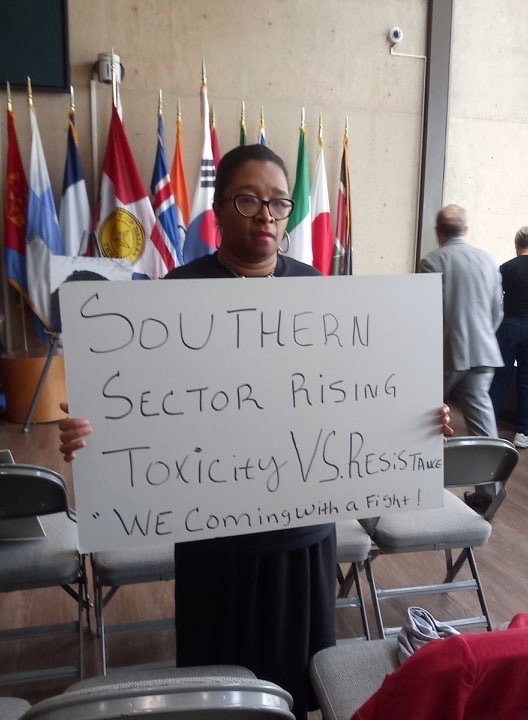 Dallas environmental activist Olinka Green at the Southern Sector Rising press conference held last week. Courtesy of Olinka Green. The alliance is calling on Sen. West to urge TCEQ to revoke the permit. A public letter-writing appeal is posted on Downwindersatrisk.org. The long-term goal announced by speakers at the March 20 press conference is to redress environmental injustices in Dallas. Representatives of 12 organizations that participate in Southern Sector Rising meet on Sundays at GoodWork co-working space to strategize actions toward that goal. 3. Restore the Dallas Environmental Health Commission “to give citizens a monthly public forum for their concerns and more opportunity for input into policy.” The former commission, which shut down after August 2010, operated similarly to the Plan Commission. Composed of city council appointees, it met to receive citizen concerns, convene hearings and gather testimony and submit recommendations to the city council. The campaign began requesting appointments with council members to ask support. Plans to picket Blue Star were in the works.